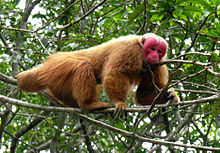 Uakari is the common name for the New World monkeys of the genus Cacajao. Both the English and scientific names probably came from indigenous languages. They live in South American rainforests. When excited or upset, their red faces become even redder. Wikispecies has information on: Uakari. ↑ Parker, Jane; Frances A. Dipper. DISCOVERY Oceans and Rainforests. 2000 Quarto Children's Books. p. 46. ISBN 1-57145-445-4. This page was last changed on 12 March 2019, at 04:47.